Lavera Vegan Moisturizing Cream 24h gives your skin all the moisture it needs. Formulated with organic oil of wild rose seeds known for its regenerative properties, this treatment attenuates the first wrinkles and moisturizes the skin durably. Your face is rejuvenated and relaxed. Thanks to its richness in macadamia nut oil, this cream is easily absorbed by the skin. Its creamy texture gives you a moment of relaxation on a daily basis. 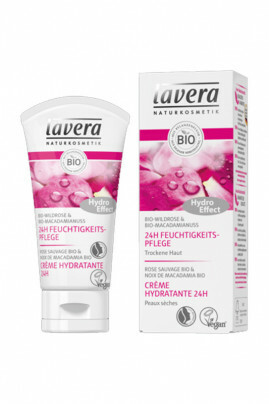 This Lavera Moisturizing Cream will delight dry skin! Naturally hydrated skin with Lavera 24 Hour Moisturizing CreamMorning and evening, apply the cream on the face, neck and décolleté previously cleaned. Make penetrate by light circular massages for a moment of softness and well-being. A 100% natural & vegan composition to moisturize your skin !